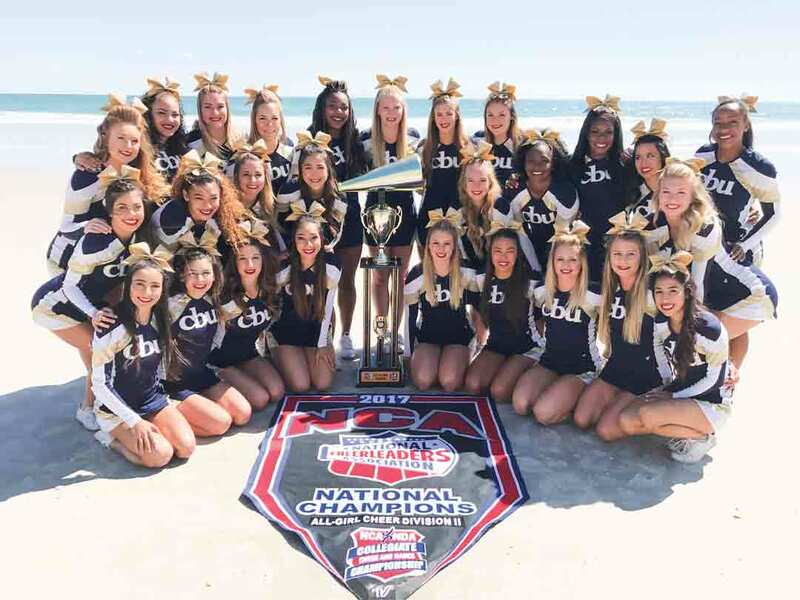 California Baptist University’s cheer team took home its fifth straight National Cheerleaders Association Championship title in the Division II All-Girls category, April 7, remaining undefeated since 2013. Tami Fleming, head coach of the cheer team, said the feeling of winning the NCA Championship was beyond incredible. “This is the fifth year in a row CBU’s cheer team has taken first in the NCA, but this year’s win (was) much more special than last year’s. Our routine at NCA was the best out of the season,” Fleming said. Additionally, for the first time ever, two stunt teams went home with trophies. One team took home the group stunt title, while the other team placed third. One group achieved a zero- deductible routine to place first with a score of 54.60 for the first time in CBU history. The first-place cheerleading stunt group was made up of Taylor Contratto, sophomore exercise science major and flyer, Taylor Frasca, sophomore kinesiology major and backspot, Dazmyn Dull, junior kinesiology major and base, and and Evynn Richard, sophmore kinesiology major and base. The second-place cheerleading stunt group placed third with a score of 53.13. The group consisted of sophmores Raylene Sadorra, healthcare administration major and flyer, Morgan Willis, undeclared major and base, Alexis Humphrey, criminal justice major and base, and Breanna Krumbs, junior kinesiology major. Willis said she did not know what to expect when the NCA began the stunt group awards ceremony. The cheer teams celebrated the win together with their celebratory tradition at the beach. “As tradition, after receiving their trophy and banner, the team ran into the ocean with their uniforms singing ‘We are the Champions,’” Fleming said. Frasca, said she could not find the words to describe winning first place with her stunt team in Daytona. The team puts in many hours to achieve these successes for CBU as they train year -round, averaging 10-15 hours a week. Frasca said all the time put into perfecting the routines was worth it. “All the blood, sweat and tears put into this year and the time sacrificed for cheer definitely paid off,” Frasca said.